This group photo, part of our growing photographic archive curated by Dr Helen Wilson, was probably taken at of one of our Annual Meetings, maybe in the 1920s. Unlike many of the photographs in the collection, the original bears no identifying information. You can click on the photo to see a much larger version. So far the only person we have been able to positively identify is Richard Hansford Worth (1868–1950) who is seventh from the right on the second row. There have been suggestions that the seated gentleman on the far left may be Robert Burnard (died April 1920 – a bit early, we think), and that the man with the white beard on the left of the back row may be Richard Pearse Chope (1862–1938) – this is based on a photo published in our 2012 Transactions (page 34). 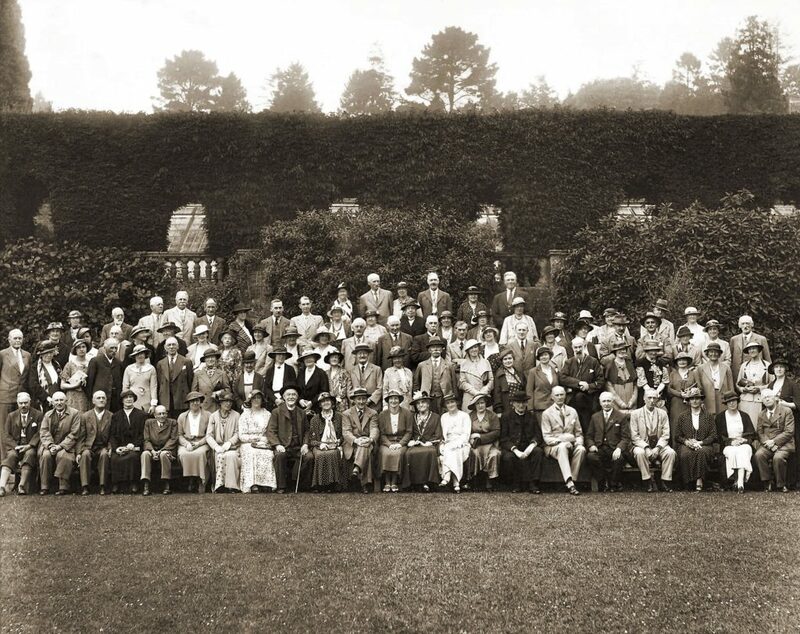 We would expect the President would be sitting in the centre front, so is that Lady Radford, making this Lynton in 1928? If you can help identify the occasion by identifying any other people, or the period from dress-styles, or the location (there’s not much to go on, but there do appear to be greenhouses behind the tall hedge), then we would be pleased to hear from you. There’s a list of all our annual meetings/conferences, their locations and presidents at the end of this page. Any clues would be welcome, so please email us at mysteryphoto@devonassoc.org.uk or use the “Leave a reply” box below. (Note that your comment won’t appear immediately, and the email address that you enter won’t appear at all). The rather downcast looking gent in clerical garb and dark hat seated 7th from the right looks as if he might be Rev. H. Hugh Breton (1873-1936), based on a photo of him in the facsimile edition of his “The Forest of Dartmoor”. The lady at Hansford Worth’s right is his wife Annie.